State Department says Kurds have made progress in Kobane but it "remains contested". The United States said Monday that the battle for control of the Syrian town of Kobane was continuing, despite claims by Kurdish leaders that their forces have recaptured the area from Islamic State (ISIS) jihadists. Kurdish forces, backed up by coalition air strikes, had made progress in recent fighting but "Kobane remains contested," State Department spokeswoman Jen Psaki said, according to the AFP news agency. 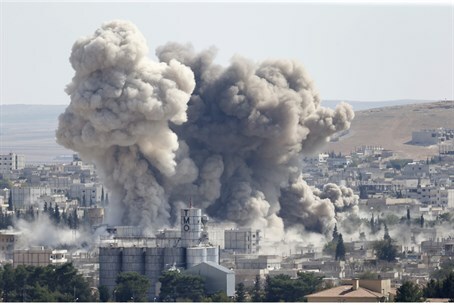 ISIS "has put a great deal of resources into Kobane," she told reporters. "They're clearly not succeeding, and we are pushing them back. But I don't have confirmation fully of it being a complete process." The Pentagon also said it could not confirm accounts from Kurdish militia and the Syrian Observatory for Human Rights that Kurdish fighters had full control of the town near the Turkish border. "I'm not prepared to say the battle is won. The battle continues, but friendly forces have the momentum," spokesman Colonel Steve Warren told reporters. Kurdish forces now controlled about 70 percent of the territory in and around Kobane, he said, according to AFP. The fight for Kobane, which has lasted more than four months and left nearly 1,800 dead, has taken on symbolic importance. ISIS has poured in fighters and weapons and filmed its own propaganda videos there, even as international media across the border in Turkey captured imagery of bombing raids.